The SOMO Event Center features concerts from world-renowned musicians. Located in Sonoma County, CA, the venue was founded by the former president of Bill Graham Presents. I was hired in the summer of 2015 to design and illustrate promotions for four concerts. I worked with the Director of Marketing to produce posters and advertisements for both print and web applications. 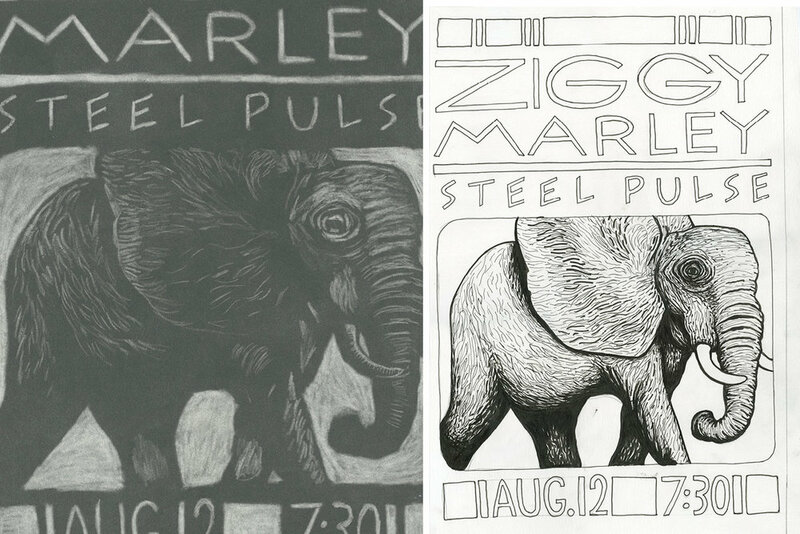 The Ziggy Marley and Steel Pulse was the first show I did for the SOMO Event Center. I choose pretty typical subject matter for a reggae show, but I think what makes the poster stand out is the technique and colors. I started by sketching out the composition and playing with the size relationships between the text, shapes, and elephant. I left a box at the bottom for the type. You might notice—as my employers did—that I didn’t leave enough space to prominently display the name of the venue. This holds true with all four posters in this series, and was an important lesson for me in learning how to plan ahead so that my compositions will work well in all needed sizes and formats. Once I was happy with the composition, I drew it to scale and traced a couple other versions in different media: For the first, I applied a layer of powdered graphite onto a blank piece of paper and erased out the highlights. For the second, I used ballpoint pen. I added color in Photoshop by using the images as masks, which also added texture. Once the poster was done, I formatted the imagery to work as a handbill and web ad. I separated the text from the image and cropped where needed. The first two images are the handbill, and the second is the web ad. 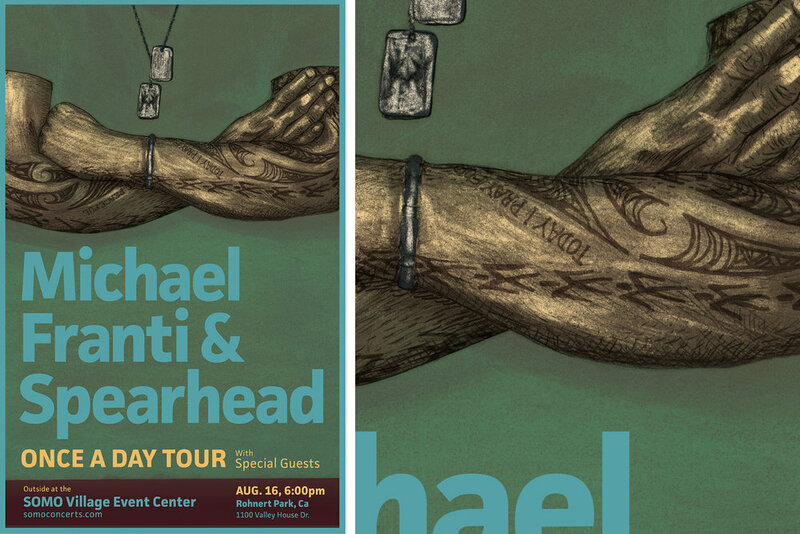 The next show was for Michael Franti. I worked from a photograph supplied by his promoters. By zooming in on his crossed arms, I alluded to his message of social justice. I used basically the same technique as the Ziggy Marley piece, where I digitally layered tracings of graphite and ink. For the artist’s name, I chose large, bold, sans serif type because I liked how the solid shapes contrasted with the textures in the drawing and complemented the minimal nature of the composition. I also liked the way that the colored border looked on the Marley piece, so I decided to repeat it in all four posters as a way to unite the series. For the Rebirth Brass Band show, I was inspired by a video of the band playing in the streets of New Orleans. I combined different stills from the video into my own interpretation of the scene. I approached this poster differently. Since I struggled with reformatting the previous images in different dimensions, I wanted to make sure that the imagery for this poster would translate well in different formats. As I watched the video of the band, I sketched thumbnails that could be cropped both vertically and horizontally. The idea was that it could be used as either a poster or a banner. It worked out pretty well, as you’ll see below. I approached the Dark Star Orchestra show with the same thinking about flexible layout. The concept is a skull-shaped moon orbiting an eclipsed star with name of the band. I rendered each element separately so that I could move them around in different formats. Despite my efforts to make the Dark Star image easily adaptable for different formats, I never was quite satisfied with the composition in the vertical format. Perhaps I overlooked this because I figured that by breaking it into pieces, I would be able to get the composition right later on. This technique, as I discovered, was no substitute for solid preliminary drawings. It did, however, make composing the horizontal format of the banners and two-up ads much more effective than the ones for the first two shows. Because the first two posters worked only as vertical compositions, I had to take the imagery out entirely for the banners.